It was announced last night at a glitzy awards ceremony held at Horwood House, Buckinghamshire, that Paul Tomlinson has been named Entrepreneur of the Year 2013 by the Federation of Small Businesses Bucks Awards team. This is the first year the FSB has hosted their nationwide awards programme in Buckinghamshire and Mirus IT have been keen advocates of the initiative since hearing the announcement, also sponsoring the category for Training and Development. organisation is still pushing forward with vision and innovation. Throughout my own personal career I have learnt that much of being a successful businessman comes from sustaining the spirit and passion for what you do, and although this award has my name on it, it could not be achieved without the collective energy and enthusiasm from a great team working with me. Mirus IT were also runners up by a close margin to the overall winners award based on combined category points. Please find full list of the winners here. 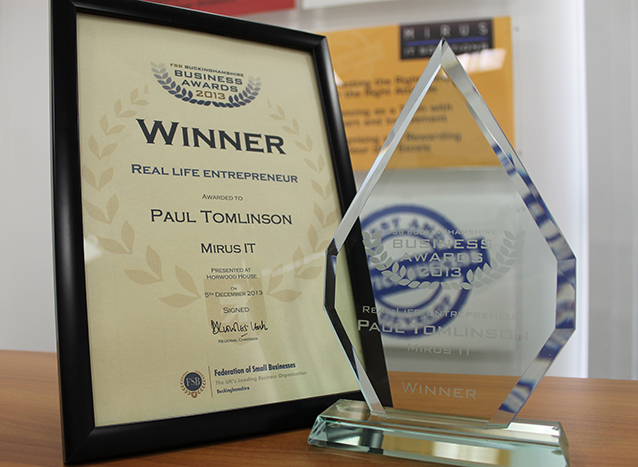 Paul Tomlinson is joining the list of at the Small Business Fortnight hosted at MK College speakers with a presentation on Entrepreneurialism on Tuesday 10th December at the Silbury Arcade campus. Mirus IT also sponsored the Training and Development category on the night and would like to congratulate The Arcana Group on winning this category.